It’s also obvious, from the model’s elaborate hair style, that a lady’s maid is a must. ‘Manchette’ means cuff or ruffle; personally, I’d have called them frills, but, doubtless en manchette sounds more haute couture. 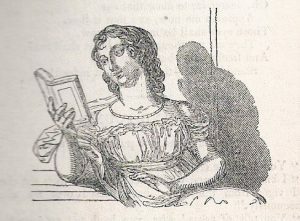 There are a number of small black and white ‘embellishments’ in the magazine and the magazine opens with this print of a reading lady. Underneath is written: Richard Ryan to a Young Lady: on seeing her reading a volume of his poems . This is followed by the poem itself. The poem ends: Say, what avails it, when I’m gone / What future ages think of me? /Oh, dearer far to know that one / Approves me now, and that is thee. Your days will last and you enjoy their time. The rich man’s prison and the poor man’s fare. I’m not sure what the second line means but the general sentiment is clear enough. 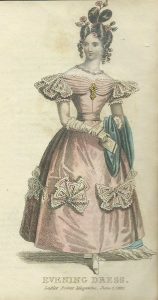 The written description of this violet-coloured satin is illegible in places. 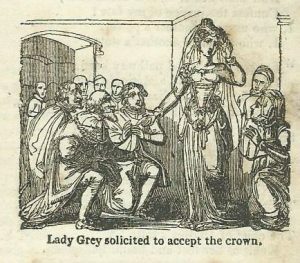 The illustrations are hand-coloured and occasionally, as here, the paint was still a touch wet and left a smear on the opposite page which obscured some of the description. I have to say that I’m not a fan of those absurdly wide shoulders. Not a view of the forceful, intelligent and sophisticated Anne we hold today! 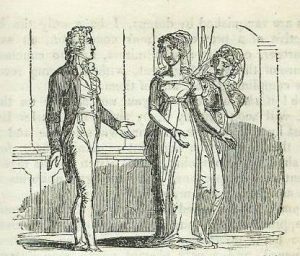 The short story, Flirtation – a Tale of Modern Times has interesting echoes of Lydia Bennet. When the regiment comes to town, the lovely Emily’s attention wanders from the eligible Charles, who adores her, to the fascinating Colonel Darlington … Will Emily come to her senses before Charles runs out of patience? Or will Charles turn to her sensible older sister, Lucy? Alas, poor Lucy doesn’t even get a look in; at twenty-seven, she’s far too old. Though, if I were editor, I’d demand that Charles dumps the tiresome Emily and goes for sensible Lucy instead. The hair looks fiendishly difficult to do, though, from the way it’s described, one feels that any half-competent lady’s maid should be able to do it in a trice. And what on earth does ‘a delicate height’ mean? Occasionally, the magazine allows a small article about more serious literature, see the illustration above. Underneath it is a short description of Burns’ birthplace; the cottage was actually built by the poet’s father, and we have the description of it in a quote from Burns’ The Cotter’s Saturday Night. 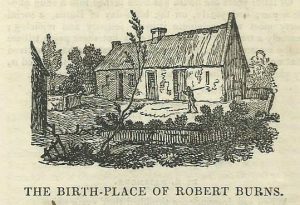 The article ends with the note that ‘the house has been turned into a snug public house’ and the landlord has pinned up the following inscription by the door: Halt, passenger, and read; / This is the humble cottage, / That gave birth to the celebrated /Poet, Robert Burns. The Ladies’ Pocket Magazine tells us a lot about the period: what ladies wore, what they read and how they thought. Or, perhaps, it might be more accurate to say, what the, presumably, male editor thought they should be reading and thinking. I love the sound of this book. Exactly the kind of thing that gives a real feel for the times. 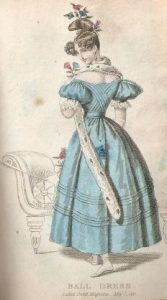 Fascinated by the use of beret to describe both the hat and then the sleeves of another dress. I just wonder what they meant by it at the time. The hat is obviously not what we would call a beret now. But the sleeve gathers into the arm and that kind of fits. But I suspect it meant something other than our notion of a beret. I’ve been wondering about the mysterious ‘beret’, too, Elizabeth. I looked it up in my French dictionary – which was helpful for words like ‘manchette’ – but it said only, ‘cap’ or ‘Tam o’ Shanter’. As far as I can make out, the 1831 ‘beret’ meant a complicated hat with ribbons etc coming off in different directions – and maybe the beret sleeve was similar. 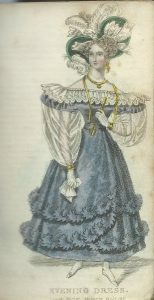 My ‘Handbook of English Costume in the 19th Century’ mentions the ‘beret’ several times but, unfortunately, doesn’t define it.